In the playoffs, an entire season’s struggle is compressed into a matter of innings. Each pitch, each at-bat possesses heightened importance, and in the crucible of the playoffs teams must be focused, unified and resilient when things go wrong. The weekend started well enough. At 13-5, the Wilfrid Laurier University men’s baseball team entered the OUA playoff weekend as the regular season champions, and they demonstrated why in their very first game. An offence led by Will Bibbings (two for three at bat for two RBIs) executed a 9-1 drubbing of Ryerson, while Austin Hassani’s effective pitching permitted only five hits and a single run. However, game two on Friday afternoon saw fifth-seeded Guelph sprint out to a 10-2 lead by the top of the fourth. Sluggish at first, Laurier’s potent offence revved up with six runs in the final three innings, but Guelph was able to hold off the Golden Hawk comeback, winning 10-8. Entering game three, Laurier had to beat Queen’s by five or more runs to earn a favourable matchup in the semi-finals. Pitcher Christian Hauck was well aware of his team’s fortunes when he took the mound that game, but as the day progressed the University of Toronto beat Brock, ridding the Golden Hawks of any need to beat Queen’s by five runs; all they needed was the win. Except Christian Hauck wasn’t told this. Instead, he remained on the mound, continuing his masterful, near-shutout performance, that only in the seventh inning was marred from becoming a no-hitter. Laurier beat Queen’s 4-0 and when Hauck left the mound, Symington explained that the entire team was overjoyed to tell Braun that his performance had helped punch their ticket to the semi-final. The Wilfrid Laurier Golden Hawks squared off against the Laurentian Voyageurs at 10 a.m. Sunday morning, and quickly ran away with the contest. First baseman Keifer Quick was the high-scorer for Laurier on the day, circling the Voyageurs bases for three RBIs, while A.J. Padmore’s pitching refused to yield even a single run. Offensively and defensively, the Hawks rolled, and the 10-0 victory set the tone moving forward. This 2018 championship is just Wilfrid Laurier’s second for men’s baseball, awarded to a team whose labouring for this victory began well before this year. However, going forward must also including reaching backward, because facing off against the University of Toronto meant a rematch of last year’s title game. In 2017 when the Golden Hawks and Varsity Blues met in the OUA championship, an early triple by U of T commenced their offensive march, that resulted in an 8-3 victory over Laurier and the OUA title. Sunday began similarly, but even when U of T built a 2-0 lead going into the fourth, this mature, cohesive Laurier team did not panic. Stalwart pitching by Ben Braun halted U of T’s offensive advance, while Symington explained that Laurier’s players were confident that it would only be a matter of time before their prolific hitters started making contact. Laurier’s persistence was rewarded with a run in the fourth, and again in the sixth with two more. On the mound, Kyle Symington pitched U of T’s batters to a deadlock, until, like a punch to the gut, U of T knocked off its third run of the day for a ninth-inning score, tying the game at three apiece. In the bottom of the same inning (tenth) Laurier’s offence failed to respond, necessitating overtime. “My hands started to shake and everything else, but we just stayed focused on what we had to do,” Symington said. Veteran players remembered losing to U of T.
They likely felt a pang of horror when their rivals stole a run late in the ninth to tie the game and force overtime. So maybe that is why it took a player unburdened by last year’s demons to break the tie. After a scoreless inning for U of T, Laurier took the field in the bottom of the tenth, and Matthew Komonen’s bat brought the OUA championship to the purple and gold. 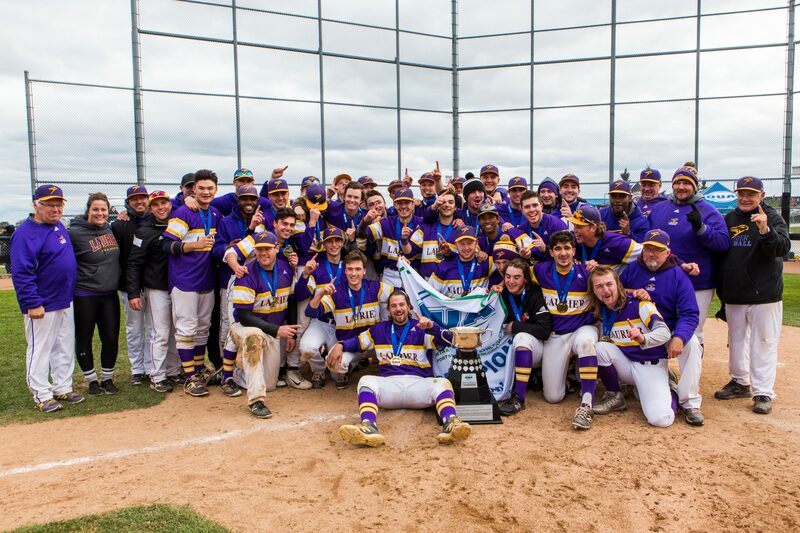 The rookie outfielder from Etobicoke connected for a walk-off single that culminated with a purple and gold flood, where his fellow Golden Hawk players rushed the field to join him and celebrate their title. Kyle Symington explained that the difference between each of the title games, and the team’s morale during each is difficult to describe. When pressed he kept returning to the phrase, “it’s just different,” which is maybe the best answer of all. It’s difficult to put your finger on that special ingredient, the extra little magic that puts you over the top. Whatever the ingredient, this Laurier team had it in spades. Their season was one of strife, high highs and low lows, but this year did not turn out like last year. Instead, up to the very last moment, they had everything they needed. So this time when they squared off against rival U of T, the results were just different.